2019 Bookings are Now Available. PLEASE NOTE: The above nostalgic video and many images on this site were shot during a low period for Lake Michigan. Lake levels have recently risen and our beach is smaller than it appears here. Wind and weather often change beach size and conditions daily. Twin Cedars sits right on the beach and features 3 bedrooms (sleeps 6) along with a log cabin interior, field stone fireplace, open kitchen/dining and living room and a great sun deck. A Door County Classic! Log cabin with 3 Bedrooms (sleeps 6), Wrap around, glassed-in porch, double height living room with stone fireplace - this was our family's original cottage. Greenwood features 2 bedrooms (sleeps 6) and a beautiful knotty pine interior, including a ﻿large, custom kitchen. Dedicated beach space is included. 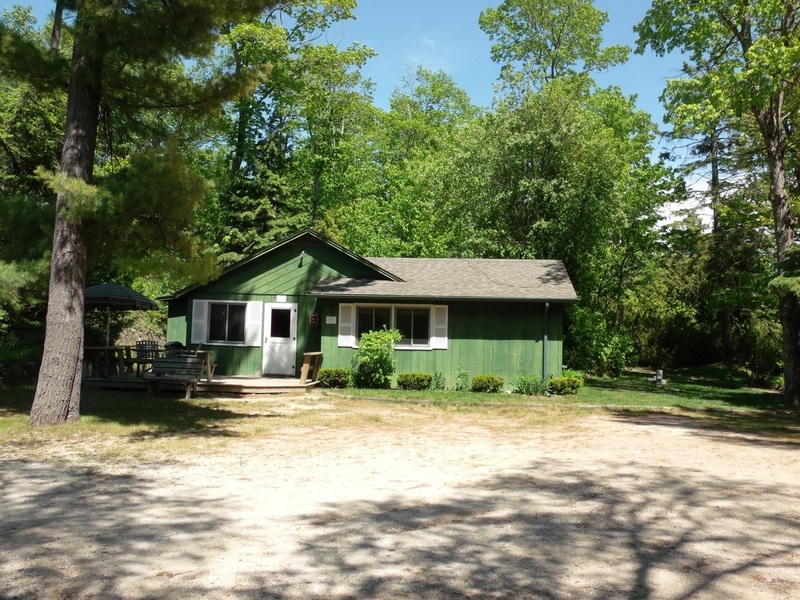 Four vintage housekeeping cottages nestled on Lake Michigan are available for weekly rentals to your family. In fact, we’ve been welcoming vacationing families to our beach for 80 years. 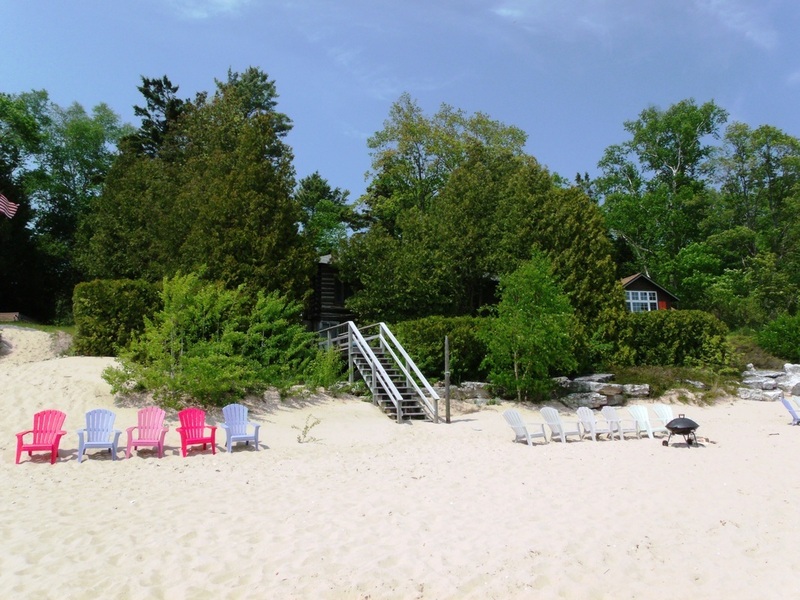 Each cottage offers dedicated space on our beach. 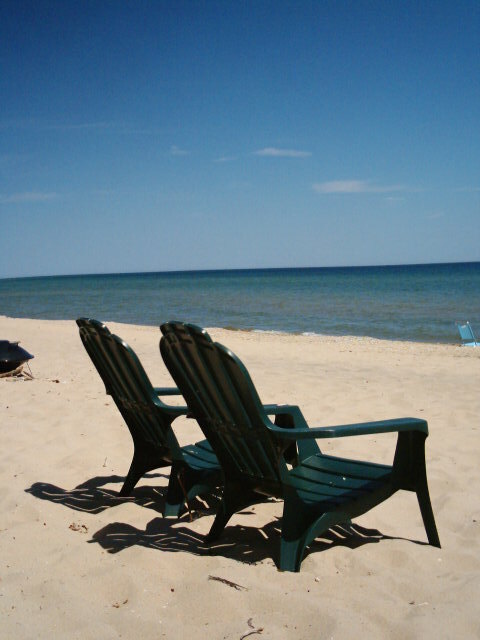 And while Lake Michigan levels are high at the moment and the beach is limited in size, the sand and the surf will take away all of your cares as you slip into relaxation mode. At Olson’s, you won’t find many of today's distractions. Here, a day of activity on the beach can be followed by a family evening in front of the fire. It’s a simpler kind of vacation, a chance to unwind and relax, yet Door County activities such as shopping, biking, exploring, theater, dining and golf are just a short drive away. Each of our housekeeping cottages sleep 6 in different bedroom/bed size configurations. 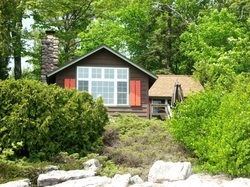 (see our individual cottage pages for complete details). All feature modern kitchens with microwaves, central heat, bathrooms with showers and firewood for the fireplaces and fire pits. Guests are responsible for bringing their own linens and supplies. Olson Cottages are just right for the family getaway, or a romantic week for two. 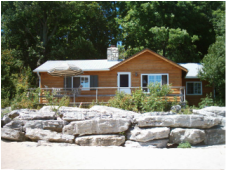 Our classic cottages are situated on Lake Michigan and the sounds of the waves provide the perfect backdrop for a vacation to remember. It takes a certain type of person, a mind frame, a willingness to unplug to truly enjoy a week or more at Olson's. We're a classic beach cottage resort where rest, relaxation, a good book, a long swim, an evening fire and time with those you love are the greatest pleasures you'll enjoy. If you want to get away from it all, this is your place. If you'd rather have a full-service resort with all the amenities, perhaps you should look elsewhere. Please be sure to visit our About Us page to learn more about what is and isn't included in your vacation time at Olson Cottages. The beach is almost empty. The children are back in school. The days are still long and bright. Door County’s finest shops and restaurants are open and ready to serve you. Tee times are easier to get at the county’s wonderful courses. The trails at the state parks are less crowded. It’s September in Door County and Olson Cottages is as welcoming and appealing, if not even more so, than during the months of Summer. The weather may well still allow beautiful days on the deck and long walks on the beach. Nights are toasty by the fire and the efficient central heat makes shivers a thing of the past. No matter which cottage of ours you choose, you’ll enjoy a week at our secluded private beach in a cottage weathered by time and steeped in tradition. As October approaches, green turns to crimson, gold and russet, mixed with the evergreen of pines and hemlock. The lake is cold, but the beach still inviting, the shops still open, the state parks and lighthouses still a delight and the golf courses, theaters and restaurants still irresistible. As Sister Bay’s Fall Fest gets closer, perhaps a long Columbus Day weekend or a quieter few days at our special family cottages is in order? A relaxed pace prevails in the Autumn, but don’t let that keep you from reserving your cottage now for an unforgettable time in the kingdom so delicious, Door County in the Autumn of the year. Click HERE for availability and rates. Our reservation process begins the previous Fall with preference given to our existing guests. Please contact us via the form below for more information and for reservation inquiries. We'll get back to you in the order of inquiry and as quickly as we are able.